We have a slightly modern, bright and beachy lake home that these are perfect in. They don't give off a TON of light, but are great mood lighting for our kitchen nook. The pin pricked metal is a bit shiny and looks so beautiful at night with the lights on. Mine are definitely a shinier silver and don't look at all hammered like the photo. Beautiful pieces! July 27, 2014 by Rich M.
They look beautiful in our downtown condo over the island!! Sometimes the most simple ideas are the best. Case in point: the beauty of rustic, pierced metal and the alluring play of light it creates as an electrical fixture. 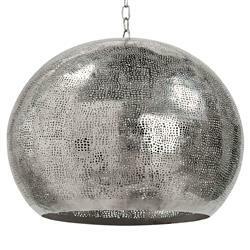 This gorgeous sphere casts points of light; scattering the light gemstones on the walls and ceiling of any room.